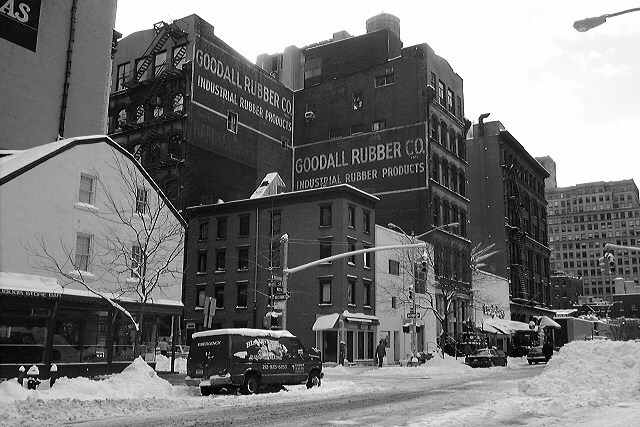 The Goodall Rubber Co., established in Philadelpha in 1906, opened its New York City office in 1911 at 12 Gold St. The New York branch was a sales and warehouse operation. Manufacturing took place in Philadelphia and later in Trenton. Goodall had several locations in lower Manhattan before moving to this building at 5 White St. in the late 1930's. Probably the signs were painted at that time. Goodall remained in this building until the 1970's when they left the city and relocated the office to Rutherford, New Jersey. 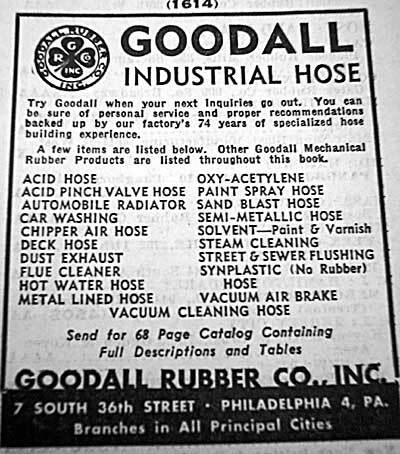 Click (here) for ad showing various Goodall rubber products in 1945. The founders of Goodall Rubber Co. were Howard W. Goodall (1872-1951), William S. Feeny, and Frederick D. Stovell. Goodall and Feeny had been employed at Latta & Mulconroy Co. in Philadelphia (a distributor of rubber goods) from around 1890. (See Dixon Valve website for Goodall's later involvement with the Dixon Valve & Coupling Company.) Stovell had been in the paint and valves business, also in Philadelphia. Frederick B. Williamson, Jr. (president of Goodall Rubber in 1945) managed the New York office from around 1915 until the 1960's.